Work meets play in the upstairs office space, where a mismatched desk and chair are all business, while book breaks can be taken in the window seat. Framed banners enhance the masculine feel of the office, where a sofa tucks into a custom-built nook. The younger daughter’s bedroom is viewed here from a shared bathroom clad in Fireworks wallpaper by Albert Hadley. A kaleidoscope sculpture by Boston-based artist Damien Hoar de Galvan adds a splash of color to a guest bedroom. The home’s central hallway serves as a gallery for the owners’ collection of original artwork, as well as providing access to each of the first-floor rooms, with larger doors to public spaces and smaller openings to more private areas. Thematic bronze sconces by Visual Comfort flank the living room’s formal fireplace; the art over the mantel is by interior designer Jill Goldberg. Red accents pop against the pale blue background in a boy’s bedroom. Broad stripes on the ceiling give the nursery a look that’s cute but not cloying. Soft greens and neutrals keep the master bedroom feeling serene. The basement was reconfigured to create a rec room and den for family fun. The library was turned into a playroom and homework center, with open shelving and a bright pin board above each desk. Designer Erin Gates updated the room by swapping out the wood fireplace mantel for a surround of marble and limestone and adding twin built-in bookcases. Neutral tones and simple, comfortable furnishings make the living room a favorite place to unwind. Splashes of yellow burst against the pale gray and white of the family room. A custom Stark rug with a geometric pattern ties everything together nicely. The entry is a study in black and white contrasts. The wool stair runner looks like sisal but is easier to clean. To introduce architectural character into the bedrooms, each was given its own niche; the one in the master was embellished with lacy Weitzner wallpaper. The master bedroom includes a sitting area. The gate’s X-motif is repeated throughout—even in the custom baby gates the owners ordered. The 9,200-square-foot home sits on nearly an acre landscaped by Gregory Lombardi with a collection of New England perennials and a garden gate that is original to the 1908 house. A circular rug from Surya echoes the shape of the family room in the addition. “It was important to the client that they have a great entertaining vibe in that space,” says designer Josh Linder. Chevron inlays animate a chest in the home’s entry vestibule. Modern furnishings help leaven the living room’s formality, as in the pair of wing chairs rendered in acrylic. Windows look out onto the wisteria-covered arbor in back and are framed by a pair of built-in display cabinets that were brightened with new interior paint and the owners’ collection of French oyster plates. An oversize ottoman that faces the inglenook can be shared by the seating groups on either side. The sofa dominating one end of the living room throws an insouciant curve at the room’s rectilinear lines. Oak beams and trim were treated to a gray-green stain that makes the wood less imposing but allows the grain to show through. The balance of classic and modern starts in the entry hall, where a contemporary open stair is combined with Murano glass lighting, and black floors play against white paneled walls. Light from a skylight catches the glossy surface of bookshelves on the first floor of the two-story library, where the palette was inspired by the chalky blue and gray tones in the hide rug. Smoked glass globes hang like a cluster of balloons, injecting a note of fun into the hardworking mudroom. The pattern on the rug that defines the living room area echoes the interlocking squares on the ceiling. A glass chandelier and crystal sconces make elegant companions to the glossy Striato Olimpico marble of the fireplace. The two spaces share many features, including twin fireplaces and Vaughan chandeliers. Tom Dixon mirror-ball pendants create a playful vibe in the family room, where book-matched slabs of Bianco Elegant marble create a dramatic backdrop for the fireplace and flat-screen TV. A custom dining table by Chaddock anchors the dining area. The chairs, also from Chaddock, are upholstered in velvet on the front and silk on the back. A cherry-paneled media room was painted a custom-mixed bright blue to add color and reflect light. Fabrics with hues of citron and fuchsia offer a lively contrast to the room’s neutral furnishings. Starr Daniels says she couldn’t pass up the digital painting that matched the master bedroom’s color scheme. The traditional staircase gets a modern boost from the chrome-legged bench. To add to the living room’s airy feel, designer Christina Sullivan Roughan removed crown molding above the French doors and hung the draperies as high as possible. The neutral palette of pale gray and white gets youthful energy with the occasional shot of sky blue. A dazzling Ricardo Rumi painting and a Lubomir Tomaszewski sculpture add contemporary flair to the library. Polished nickel light fixtures sound a contemporary note in the entry. The husband’s own abstract painting anchors a bar area in the library. Glossy black paneling brings drama to the library and evokes the feeling of an English men’s club of the 1930s. A collection of crystal decanters on the mantel furthers the Anglophilic feel. The random dots in the Stark stair runner meander from the lower level to the fourth-floor office. Comfortable simplicity reigns in the master bedroom, where delicate night tables from Worlds Away flank the plush upholstered headboard. 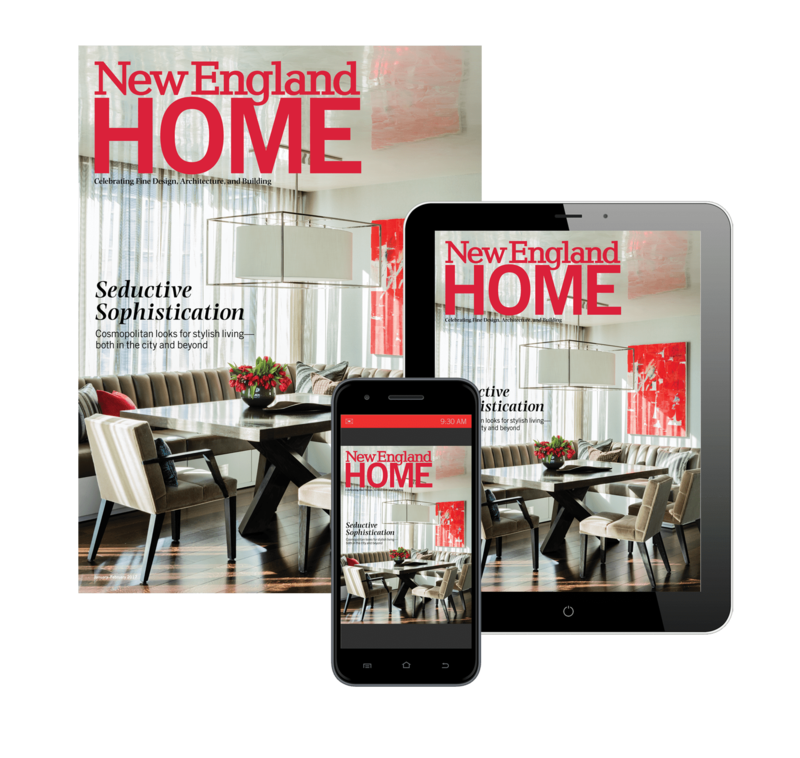 Designer Michelle Morgan Harrison introduced shine throughout the house, from the living room’s crystal chandelier to the silver-leaf coffee table to the high-gloss finish on the home’s moldings, stair balusters, and newel caps. The exterior of the Greenwich townhouse. A Barbara Barry chaise offers an alternative lounging spot in the guest room. Just off the living room, a staircase winds up all four floors of the home, originally designed by architect Anthony J. Tartaglia. Light streams from the terrace into the living room through French doors, creating a visual echo of artist Michael Zigmond’s riveting work above the bar cabinet. A Dennis & Leen sofa with a somewhat formal silhouette plays off the room’s contemporary art. A pair of Gregorius Pineo wing chairs nestling by an original fireplace are an unexpected delight in the dining room. The landscape above the mantel is by Tracey Lane. A cache of snowy china fills the new floor-to-ceiling cabinets. Decorative artist Pauline Curtiss, owner of Patina Designs in Lincoln, Massachusetts, devised the eye-catching office ceiling. “Due to the number of windows, that was the only surface we had to work with,” Russell explains. An engaging Neal Rantoul photograph hangs above the oak desk. A Ro Sham Beaux chandelier illuminates the master bedroom, where French doors open to a deck overlooking the pretty yard. Vibrant black-and-white chairs, contemporary sconces, and abstract art are fun contrasts to the living room’s understated heirloom sofa. Comfort in the family room includes a cozy sectional and ottoman along with a feels-good-underfoot Stark carpet. Russell chose Benjamin Moore’s Swiss Coffee as the trim color for every room, giving the house a pleasing continuity. In the entry, the hue is the ideal partner for the wheat-toned chest. The nursery adheres to the home’s neutral theme with rattan shades and a wicker elephant for added texture. Antique beds in the four-year-old’s bedroom belonged to Russell’s father. The windows in the room’s new bump-out bathe the space in natural light. The breezy shades can be rolled up and fastened with rope, while shutters offer flexible privacy control at the room’s front window. The screened porch is furnished with comfy sofas and tea-height tables for casual eating and reading, making it a favorite gathering spot. The living room adopts a nautical air without being too obvious. The living room is contemporary in feel, now that the old brick hearth has been replaced by a sleek stone surround. Easy-care slipcovered chairs flank a cocktail table of black grasscloth and brass. The Lucite legs of the upholstered bench at the foot of the master bed add a glamorous touch. A silk rug grounds the living room, where a sofa reupholstered by the designer in Venetian velvet and chairs re-covered in Osborne & Little Oriole fabric beckon. Ikat and animal-print toss pillows lend an exotic note. Phillip Jeffries wallpaper provides a subdued background that lets the art play a starring role. Comfy cowhide-covered swivel chairs fill the sitting space off the kitchen. A fireplace fabricated with London Fog stone commands attention in the family room. White sofas and a cowhide rug, glass cocktail table, and an airy cage chandelier are washed in light in the glassed-in conservatory. Burke painted the paneling white and dressed the unused fireplace with a screen covered in curtain fabric. The designer refers to the recamier as her “phone booth” because she lounges on it when she makes calls. With a similar palette but a different scale, the patterned upholstery works well with the Christian Lacroix rug. The family gathers nightly to watch TV on the custom sectional, which Burke embellished with tufting, pleating, and nailhead trim. n antique chandelier illuminates a group of Theodore Alexander club chairs in the great room, which Burke has dubbed “Club Z” for her husband, Mark Zeytoonjian. “I really love to blend styles,” says designer Kellie Burke, who placed a modern seating group beside a traditional one in the former ballroom of her Hartford home. A chevron paper from Candice Olson animates the entry hall; the compass rose was applied to the floor with stain. Cowtan & Tout’s Hayworth Trellis wallpaper accents the wall behind the bed. Future Grandmasters can compete at the Oomph game table. At a nearby seating area, the coffee table is topped with easy-care white-birch Edelman leather. The expansive pool area can accommodate a crowd, with its well-appointed outdoor kitchen, a bar, dining table, and two seating areas, including the custom sofas that tuck into the stonework enclosures by the swimming pool. 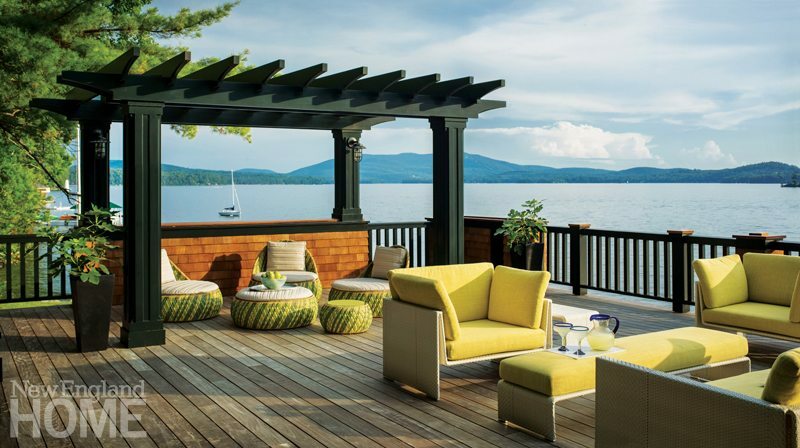 Under the pergola, seating includes natural woven Restoration Hardware outdoor furniture, X benches by Serena & Lily, and barstools by JANUS et Cie. The kids can vie for a spot on the curved settee when the family gathers for casual meals in the kitchen’s dining area. The chairs are durable Design Within Reach wishbone chairs finished in white lacquer. A seating area in the living room is brightened and lightened with hide-upholstered chairs and a glass-topped acrylic table. The deep Keegan sofas are from the Kristin Drohan Collection in Perennials fabric. The charcoal-colored millwork of the custom-built bar frames the doorway between living and dining rooms. The owners’ existing dining room table and chairs are complemented by a Devon Bench from the Kristin Drohan Collection in a vivid coral hue. Circles and squares are a thematic constant that begins in the entry with a marble-top table on a bronze base, an Urban Electric Baxter Light, and the brass rivets of the Phillip Jeffries grasscloth on the ceiling. The home, built in 1919 with Tudor-style elements inside and out, sits on a hill overlooking Hingham Harbor. Oversize windows take full advantage of the view across the circular drive, which surrounds a decorative fountain. A William Morris paper creates a traditional backdrop in the nursery, while one of the homeowners’ many Moroccan rugs adds a bold, bright accent. Footballs—each with a personal meaning for the homeowners—heighten the study’s intimate tone. An Urban Electric chandelier and a streamlined coffee table from the Bright Group lend a masculine feel. The beachy theme takes a softer turn in the master bedroom, with a calming palette of pale blues and cream. Turquoise, Amber’s favorite color, was the ideal choice for the family room’s attention-getting sectional. 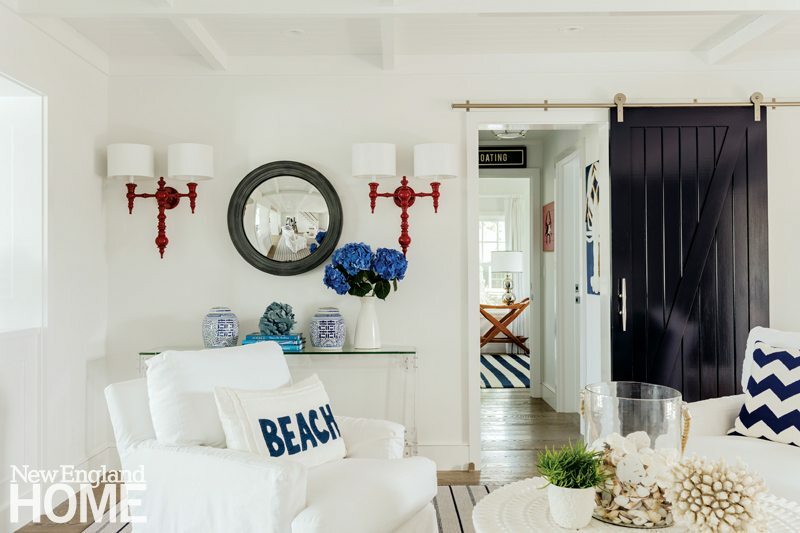 Accessories in various shades of blue, like the Stephen Gerould lamp and oomph tray, add an additional layer of beachy interest. Hanging his and her lights free up space on the nightstands in the master bedroom, where hand-painted metallic wallpaper covers the wall behind the bed. A faux-shagreen-framed mirror adds interest to the fireplace. Muse used a soothing gray-blue paint in the family room to create a backdrop for a host of lively fabrics including pillows dressed in a blue-and-taupe leaf motif from Zoffany and geometric stripes by Christopher Farr Cloth. New Lucite hardware and a freshly lacquered mantel increase modernity. The living room’s high level of -interest stems in great part from all “the varied elements of texture,” says the designer. The metal side table is topped with petrified wood, while two stools flaunt velvet-clad bases to complement their seats of striped fabric by Duralee. Pale linen curtains afford privacy and soften the windows. The arresting painting is by Patrick Wilson. The entry’s contemporary console and attention-getting art by James Nares provide a lively contrast to the traditional architecture. A brushed-steel bed from Room & Board adds a contemporary, more masculine touch to the hotel-chic master bedroom. The roomy double bedside dressers are from FDO Group. The study also serves as an informal sitting/TV room with its comfortable Mitchell Gold + Bob Williams sofa; the desk is by Excentricities. A tête-à-tête settee by A. Rudin sits in the cased opening in the double living room. 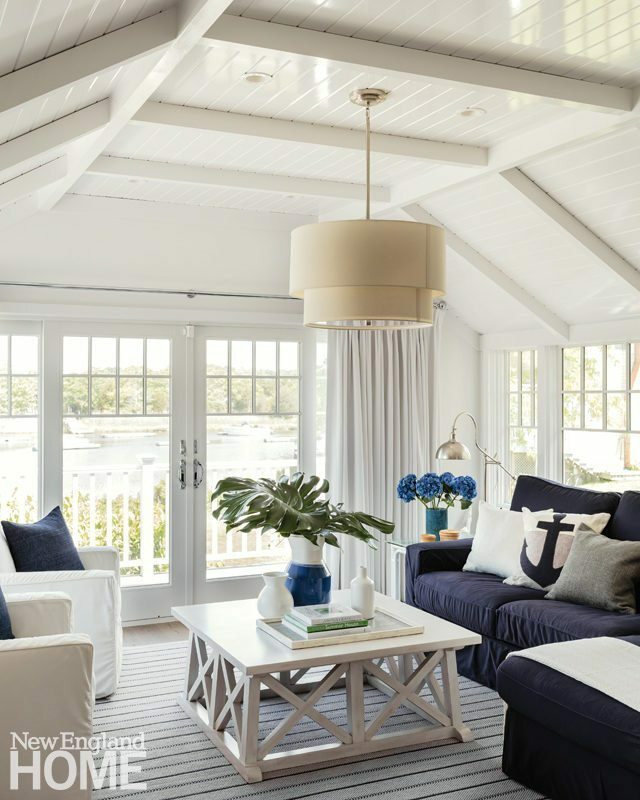 The window seat to the left is another spot to lounge and enjoy a pretty harbor view. A pair of sleek sconces flank an abstract artwork by Doug Kennedy above the fireplace, with its custom-designed mosaic surround. Glass-front built-ins hold accents and collections.